We genealogists look at many different records in our search for information on our ancestors, including vital records, as well as court, land and military records. But some of the most intriguing documents, if you are lucky enough to find them, are first-person remembrances and interviews. I used to think that only “famous” families had books written about them. But as I have pursued my own genealogy, I have found that ordinary families, too, have had a person or persons so interested in preserving their history that they have made a published record of their findings. The professional term for this historical record of a family is a genealogy. I have not yet found any Spears genealogies pertaining to my line, but I have been fortunate to find interesting source material about my Johnson forebears. Sallie Atkins, whose husband’s DNA matches my brother’s, has been researching our shared Johnson, Shelton and Franklin cohorts for over thirty years. Sallie introduced me to a collection of letters on our families between Hobart Oscar Franklin (b. 1915 Cabell County, WV) and Kenneth Charles Wilde (b. 1932). Both men, who descend from the same Franklin ancestor, had spent years independently researching their family lines. Then in the 1980, they somehow came across each other (way before the internet made it easy to find people) and began corresponding for the next twenty years about the family lines they had in common. And what a boon for everyone who shares their ancestors! I have mentioned before in my blog post of September 19, 2011 of how you can really make leaps in your research through working with others. In their own research, they each had used a combination of first-person interviews with court and census records in their efforts to find out all they could about their early ancestors. Also, both men also were familiar with Fred Lambert, a family historian in the early years of this century who traveled all over West Virginia interviewing people and recording their stories, and referred often to his work in their letters. During their correspondence, Wilde and Franklin were able to pool their information, check their theories, and see what their family sources had to say on the same topics. Franklin had the advantage of being born earlier in the twentieth century. When he started delving into his family history, several living relatives, including his mother, Luverna McComas Franklin, (b. ca.1868 Lincoln County, WV) and aunt, Viola Franklin Midkiff (b. 1867), had been around long enough to either remember some of the early ancestors or to have heard stories from people who had actually known some of the forebears who had passed away before his birth. And lucky for us, they were willing to share this information! At least some were. What were some of the themes that came up in the letters between the two family historians? As you might expect, one of the recurring subjects was tracking the migration patterns of the associated families. The Sheltons, Franklins, and Johnsons had moved across colonial Virginia through the counties of Lunenburg, Halifax, Pittsylvania, Amelia, Henry and Patrick Counties before going to Surry and Buncombe Counties, NC; they ended up in Cabell County, WV in the early 1800s. We genealogists always want to pinpoint the time and place that each of our ancestors lived and when, where and why they moved. Wilde and Franklin used the Virginia Court of Common Pleas records to track the migration of their ancestors by their court appearances. In colonial times, people went to court often to settle debts and to air other differences they had with neighbors (see my blog from January 28, 2013 for more details on the workings of American Colonial courts.) Wilde and Franklin also used County lists of Tithables, another type of court record, to place people and find out who their neighbors were. The two researchers also used the US Federal Censuses, especially the 1790 and 1800 Virginia and North Carolina census documents, to aid them in placing ancestors and in tracing their movements during the decade between 1790 and 1800. 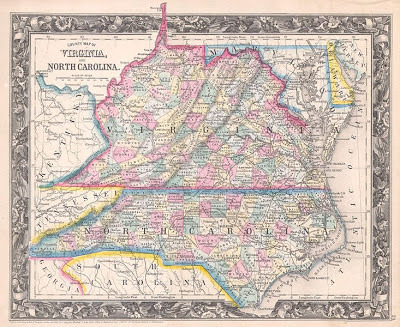 Because of their meticulous study of the records, I was finally able to see how my families had crossed from Eastern Virginia to the southern part of the state and then into North Carolina. 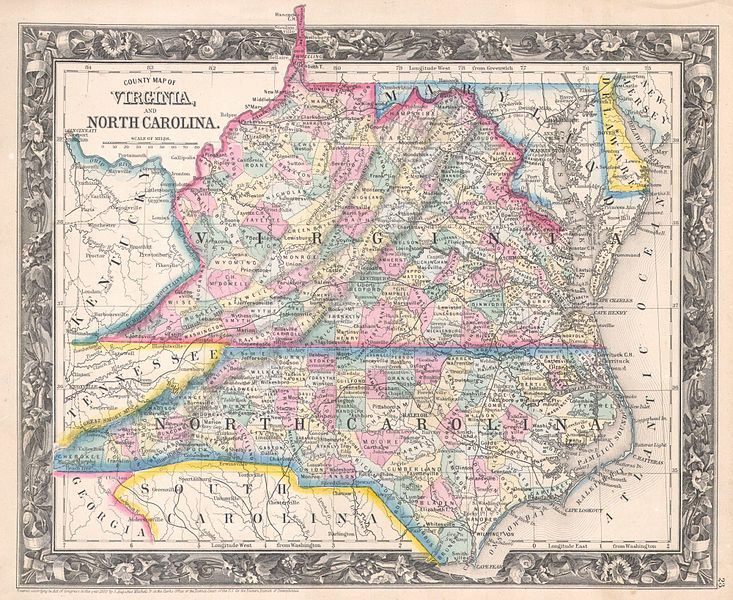 County Map of Virginia, and North Carolina, 1860, Samuel Augustus Mitchell, Wikimedia, public domain. A second recurring theme was the question of whether or not there were Native American ancestors in the family as was rumored over the years by various Franklin folk. When Hobart Franklin asked his father about this, he was met with stern silence. This is what he wrote to Wilde about the subject of ethnicity of the family: “I am so ignorant about our Indian ancestors. It was such a hush-hush in our family. Dad wouldn’t talk about his people…” (p. 559). But his Aunt Viola and mother both agreed that there was Indian blood in their family. 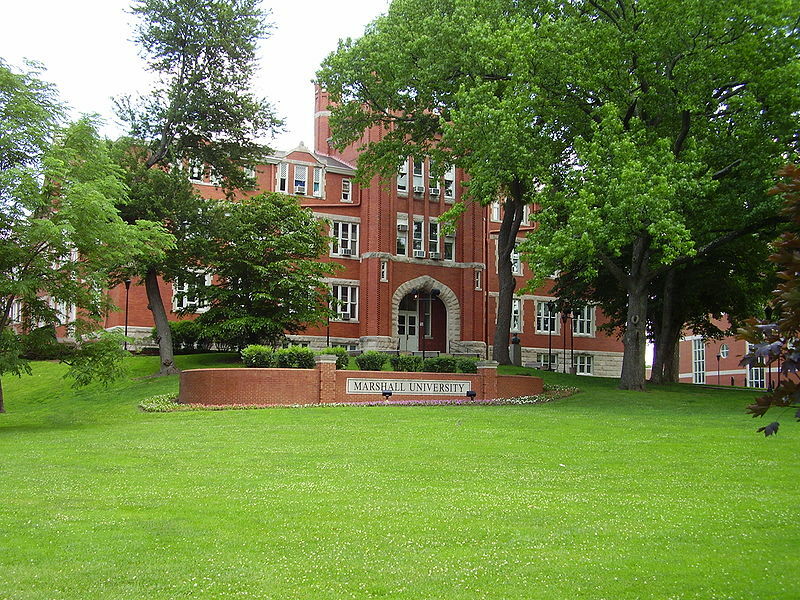 For his part, Kenneth Wilde wrote that he experienced the same “refusal to talk” or acknowledge the fact of Indian ethnicity in his branch of the Franklins. Another aspect of the Native American heritage stories that Wilde and Franklin bounced back and forth was trying to “flush out” the details of a possible ancestor, Mary Franklin, (also known as Glumdalclitch, although no one knows why she was called this) who supposedly was all or part Native American and who may have married a Franklin or had a father who was a Franklin, according to which testimony you looked at. This quest to find out about a particular individual, in this case Mary Franklin, shows how family genealogy leads researchers to study history. In a query to The Franklin Fireplace in April 1979, Wilde wrote that Mary “may have been one of the Cherokee women prisoners who were captured by General John Sevier of Tenn on a Cherokee Expedition sometime prior to 7/28/1781.” Perhaps this is the query that Hobart Franklin answered that began the long correspondence. As the two batted their information and theories on Mary Franklin back and forth through their letters, they were able to put together testimony they had gathered separately from different members of their families. Any genealogist who has been researching for any length of time recognizes this question. Franklin and Wilde were trying to find out who fathered the two sons of Mary Franklin, the Indian woman introduced above. They relied on family testimony as these births occurred in the late eighteenth century, too early for birth records. Also, they could find no marriage records for Mary, and they wondered if perhaps she never married. One of Mary's sons, William Duckworth Franklin Shelton (known as “Duck”, b. ca. 1798), was said to be fathered by Roderick Shelton as noted by the two researchers. But they found no documentation (and, to my knowledge, none has been found since) to confirm this contention. According to Hobart Franklin, some indirect evidence of Roderick’s possible parental relationship to Duck is that Roderick cared for and supported him. But Duck, according to Wilde, called himself “Franklin” after his mother. Franklin and Wilde had both heard that Mary Franklin had a second son, George “Rock” Franklin (b. ca. 1801). Wilde said that Rock always contended that his father was Solomon Stanton. Again, no documentation has been found to corroborate this theory. So, what have I learned from the discovery of the correspondence between Kenneth Wilde and Hobart Franklin? For years I have been reading stories about the Sheltons, Johnsons, and Franklins on rootsweb, genforum and other places on the web. But most of the writers of these stories list no sources. One of these stories was about Mary Franklin (Glumdalclitch) and her children. With the Wilde/Franklin Letters, I now know where these stories, that were showing up all over the internet, came from. After seeing how the two researchers used their letters to try out theories, to check the accuracy of each other’s family stories and generally to further their life’s work, I am even more convinced of the value of being part of a community of genealogists. Genealogies, first person interviews and letters are wonderful additions to a genealogist’s record collection. Look for genealogies, manuscripts, and letters about your family lines. Search in the libraries in the counties where your people lived; use the on-line catalogs. And if you’re young enough to have older family members still living, don’t miss the opportunity to ask them to share their stories. Be sure to record them. And after you collect a whole lot of oral testimonies, you might consider combining this information with the results of your other research to write a genealogy of your family. As I missed out on interviewing many living witnesses since I was born in 1945 and didn’t become interested in researching my family history until the late 1990s, I will be eternally grateful for the written legacy of Fred Lambert. He spent years traveling around West Virginia interviewing people about their families. 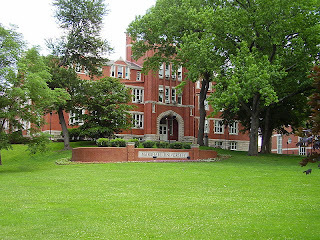 He cared enough to preserve his findings about his and my ancestors by leaving his research to Morrow Library at Marshall University in Huntington, WV. And of course I owe a huge debt of gratitude to Hobart Oscar Franklin and Kenneth Charles Wilde. Would like to find out more about Franklin and Shelton DNA.